In Part 37 of asp.net gridview tutorial, we discussed about using sqldatasource control with detailsview, and in Part 38, we discussed about using objectdatasource control. In this video, we will discuss about working with detailsview without using any datasource control. We will be using tblEmployee table for this demo. 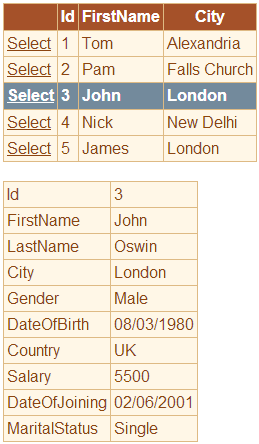 If you need sql script to create this table, please refer to Part 37 by clicking here. We will be using EmployeeDataAccessLayer, that we coded in Part 38. If you need EmployeeDataAccessLayer code, please refer to Part 38, by clicking here. Drag and drop a gridview control and a detailsview control on webform1.aspx. 1. Configure GridView1, to include 1 TemplateField and 3 BoundFields. 2. The TemplateField should contain an ItemTemplate, which includes a linkbutton, that the user can click. 3. Set the CommandName property of the LinkButton to SelectFullDetails. 4. Configure the rest of the BoundFields to get data from Id, FirstName and City properties. 5. Set AutoGenerateColumns property of GridView1 to false. 6. Finally generate RowCommand event handler method for GridView1.